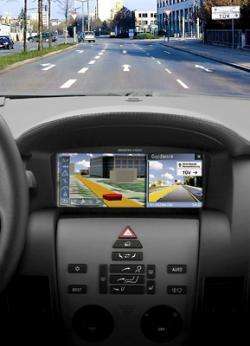 Siemens has developed a navigation system with a three-dimensional map display. These true-to-life images of entire streets and intersections make it easier for drivers to find their destinations even in unfamiliar urban areas. The system will be launched on the market in mid 2008. In contrast to systems commonly used today, this new navigation system from Siemens VDO Automotive displays different levels at highway interchanges. To ensure better orientation in cities, digitized images of eye-catching structures will be integrated into the system. With just the push of a button, users will also be able to call up on their displays tourist information, such as the opening times, admission prices and telephone numbers of museums, theaters and other attractions. By the planned start of mass production, this information service will cover 100 of the largest cities in Europe. Regarding the large volumes of data, the system runs from a hard disc. Superimposition of four different digital maps makes this three-dimensional navigation possible. The basis is formed by a digital terrain model that gives the gradient of the land with its high and low points. Superimposed over this model are digitized satellite photos. Another layer consists of digitalized 3D-buildings and contours of buildings which the system uses to generate three-dimensional views of cities. Finally, a digital street map – like today’s navigation maps – completes the picture. And the system will also be a hit with drivers of off-road vehicles: The terrain model also displays areas away from the main road network, so the system can calculate routes through wooded areas and fields. The navigation process automatically takes this data into account for cross country drives. An advanced version of the system is already in the planning stages. Soon, a camera installed on a vehicle’s front will record and digitize images of traffic lights and traffic signs, which will appear in synchronization in the navigation display.